but he did once. It's what the end effect is of all these interminable claims about mining for hockey sticks etc. What it actually does to a reconstruction. "Stokes’ most recent post, entitled “What Steve McIntyre Won’t Show You Now”, contains a series of lies and fantasies, falsely claiming that I’ve been withholding MM05-EE analyses from readers in my recent fisking of ClimateBaller doctrines, falsely claiming that I’ve “said very little about this recon [MM05-EE] since it was published” and speculating that I’ve been concealing these results because they were “inconvenient”." I've responded in a comment at CA giving chapter and verse on how he avoided telling the Congressional Committe to which he testified, which had a clear interest, about these inconvenient results. So far, no response (and of course no apology for the "sliming"). 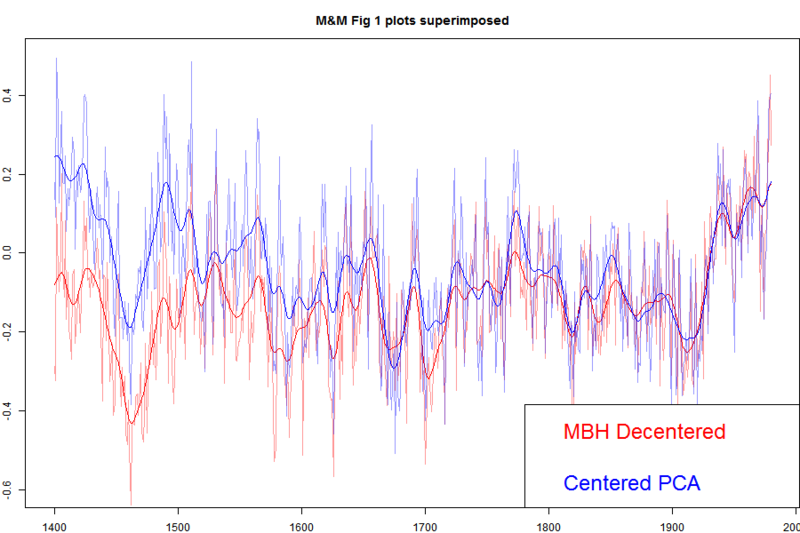 "The M&M critique of the MBH98 Northern Hemisphere climate index: update and implications". I've shown that plot in an appendix here, and I'll show it again below. But for here, I'll show the plot with the MBH decentered and M&M centered superimposed. Update: When I printed out the data from my running of the MM05 code for Carrick below, I noticed discrepancies between the numbers and the emulation.txt data on file. I've tried to track down the reason, but I think the simplest thing to do is to switch to using the emulation.txt data directly, which I've done. The MBH and the corrected still track closely in recent centuries, but there is a somewhat larger discrepancy in the 19th century. Prvious versions are here and here.. The agreement is very good between, say, 1800 and 1980. These are the years when all the alleged mined hockey sticks should be showing up. They aren't. 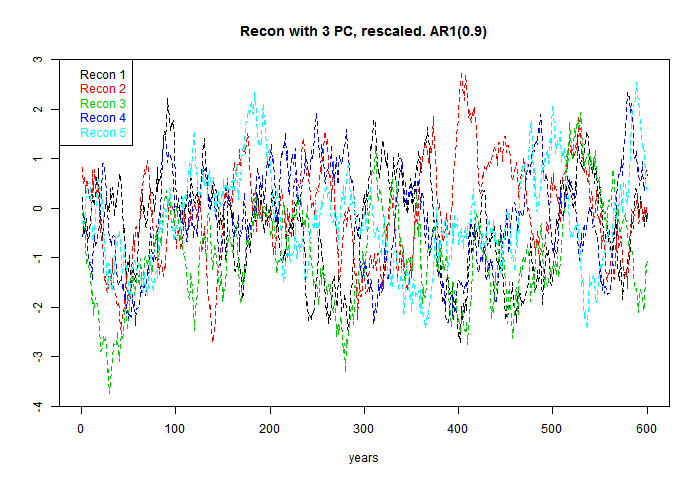 There is a discrepancy in the earlier years, which DeepClimate explains here. When Wahl and Ammann corrected various difference between the M&M emulation and MBH99 (in their case) this early period discrepancy disappeared. But anyway, for now what is important is that both centered and uncentered agree very well in the period where decentering is supposed to be mining for hockeysticks. Steve Mc has said very little about this recon since it was published, so much so that when Wegman was pressed (properly) by Rep Stupak at Congress on why he hadn't shown the results of a corrected calculation, he had no good answer, and didn't refer to M&M2005, even though he was supposed to be familiar with the code (which he had) which did it. I think this has become a very inconvenient graph. I described earlier how apparent PC1 alignments have an effect on reconstruction that disappears rapidly as more than one PC are used. I'll give below a geometric explanation for this, which explains the irrelevance of MM)5 fig 2, which resurfaced as Wegman's fig 4.2. Here is the plot direct from MM05EE. The bottom "centered" includes the removal by M&M of the Gaspe cedar data from 1400-1450, which affects those years. I've described the Gaspe issue, with some more plots here. With trouble over the 100/1 sampling, Steve McIntyre has promoted his histogram, which appeared as Fig 2 in the MM2005 GRL paper, and as Fig 4.2 in the Wegman Report. The present re-presentation as a t-statistic adds nothing. "Let me give a geometric analogy here. Suppose you live on a non-rotating spherical earth. You want a coordinate system to calc average temperature, say. You want that system to have a principal axis along the longest radius. You send out teams to measure. Their results have no preferred direction. There is a Pole star, so you histogram a Northness Index. It looks like the first one here. A sort of cos.
Now suppose the Earth is very slightly prolate, N-S, but the limit of measurement. Your teams will return results with a N-S bias. Your histogram of Northness will lbe bimodal like the second above. The spread will depend on how good the measuring is relative to the prolateness. If measurement is good, there will be rare few values, and the two peaks will be sharp. The definiteness of the histogram has nothing to do with whether alignment of the principal axis matters." 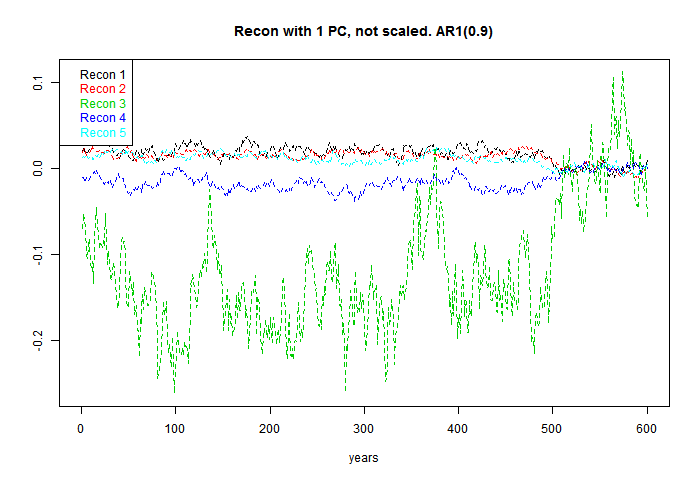 Again there is no evidence that any aspect of Mann's decentered PCA has ever affected a temperature reconstruction, despite all the irrelevant graphics about PC1. Update. Here is the corresponding emulation from Ammann and Wahl. There is now no large discrepancy in the earleir years. 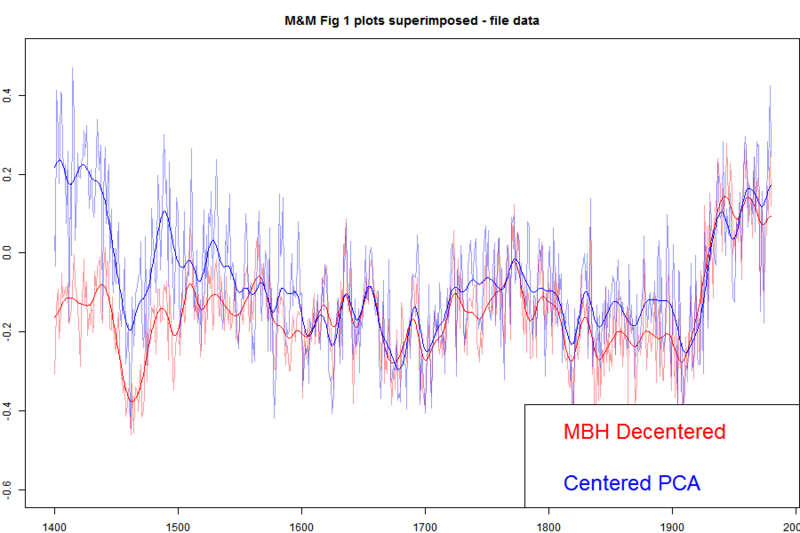 Update: DeepClimate, in a comment here, has linked to the plot below, which shows just how far MM2005 deviated from the MBH recon with centered mean - this time shown against the millenium recon. Otherwise the results are as reported elsewhere (e.g. 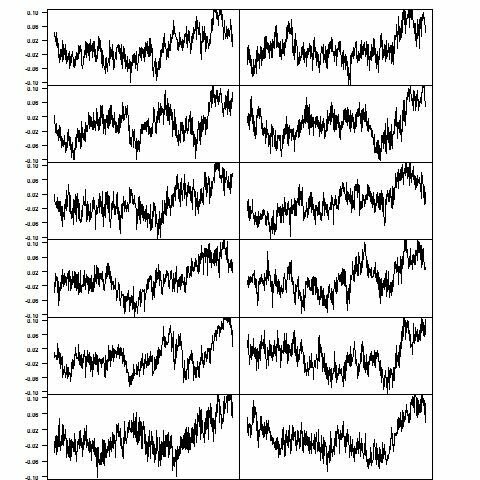 in Wahl and Ammann, 2007), but I added the comparison of, how much each PCA explains by up to 10 first PCs calculating the shares from the real variability of time series used in each analysis. 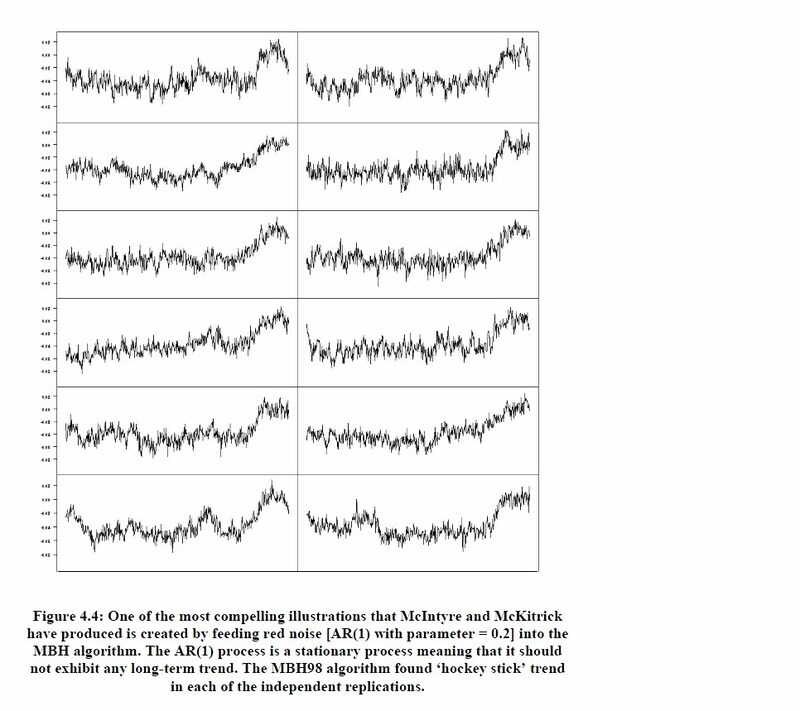 Thus the shares are calculated from the same total variance in cases (1) and (2), from slightly different in (3) and from substantively different in (4) where the variances of individual time series vary greatly. 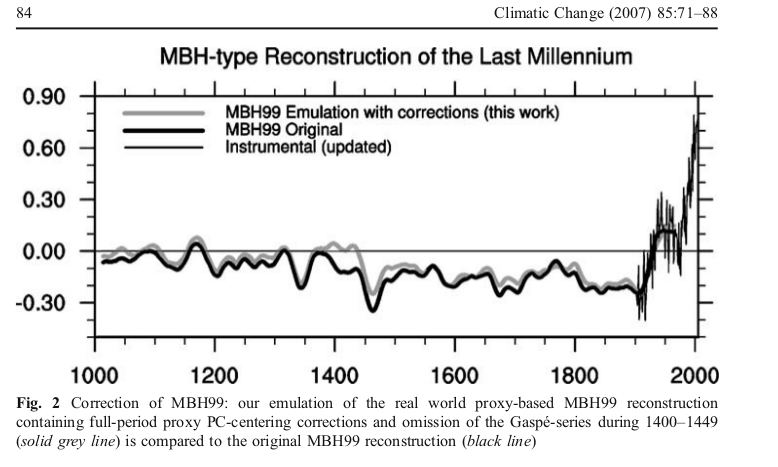 What many may find surprising is that my numbers for MBH98 are very different from those shown in several places (e.g. RealClimate). 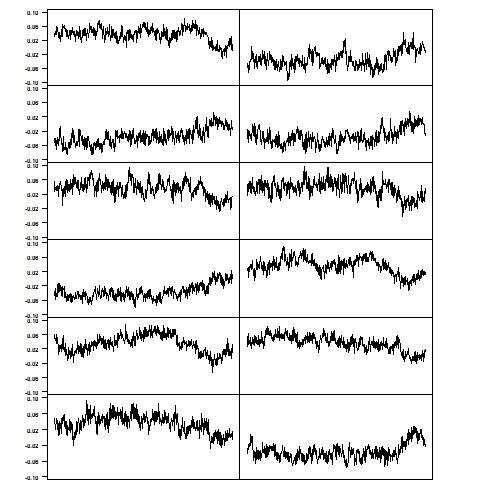 The reason is that those numbers are not based on the variability of the time series, but on variances around the short-centered mean. That adds both to the total variance and to the contributions from individual PCs. In relative terms it adds much more to PC1 than to the total. Thus the resulting number does not tell about the real variability, but is very much affected by the decentering. I calculated my values by first orthonormalizing the basis relative to deviations from full mean (the mean affects, what's orthogonal), and by using this orthonormal basis for determining, how much the space spanned by N first PCs of the MBH98 analysis can explain. Steve McIntyre has a new post up at ClimateAudit. It's called "What Nick Stokes won't show you". It's a continuation of the smokescreen about demanding the unselected PC1s be shown with orientation favorable to a hockey-stick interpretation, using a hockey stick index (HSI), rather than as his program produces them. Again pretending that it's about Wegman aligning the orientation, rather than selecting the top 1% by HSI without disclosure. He's made some pretty outrageous claims about how people here are, well I'll quote: "Some ClimateBallers, including commenters at Stokes’ blog, are now making the fabricated claim that MM05 results were not based on the 10,000 simulations reported in Figure 2, but on a cherry-picked subset of the top percentile. " I wrote a substantive response to this, soon after the post appeared. It went into moderation - I've posted the text here. About four hours later it disappeared from the queue; I don't know what is happening there. Steve says he'll look in the morning. (It's here). The mean of 1.61 for unselected decentered (MBH) matches the mid-range figure in Steve's post. The difference between 1.98 and 1.61 made by selection may not seem so great, but these are like t-values. And it shows when centered but selected has almost the same mean HSI. The undisclosed selection is about as effective in creating HS appearance as decentering. Emphasising the compression of the t-like HSI scale, centered unselected, which shouldn't have any HSI effect, and don't seem to, still show a mean (absolute) HSI of 0.65. Anyway, below the jump I'll show various plots relevant to Brandon's contention that they should be oriented. He says that it makes a big difference. Judge for yourself. But is it a legitimate difference? It makes any kind of trend look like a HS contribution, by turning it up. Here's another comparison - Brandon's reoriented MBH unselected versus centered but selected. As you'd expect from the above table, even with reorientation, they look similar. But the left has no decentering. The HS is created just by selecting the 100 top HSI out of 10000. Recent interest in PCA and paleo has got me doing some stuff I should have done a while ago. I think it is bad that Steve McIntyre and Wegman have been able to maintain focus on just the first component PC1, leading people to think they are talking about reconstructions. They aren't, and that's why, whenever someone actually looks, the tendency of Mann's decentered PCA to make PC1 the repository of HS-like behaviour has little effect on recons. I'll show why. Steve's post showed Fig 9.2 from the NAS report as an example of an upright PC1. That's got me playing with the NAS code that generated it. It's an elegant code, and easily adapted to show more eigenvalues, and do a reconstruction. So I did. Mann pointed out many years ago that M&M had used too few PC's in their recon. Tamino explained that PCA simply created a different basis, aligned to some extent with real effects, which may be physical. But there is conservation involved - if HS behaviour is collected in PC1, then it is depleted in PC2,3 etc, and in the recon, it averages out. And it does. For the NAS example, I'll show how the other PC's do have complementary behaviour, and since the HS effect of decentering isn't real physical, but drawn from other PCs, it doesn't last when you use more PCs, as they do. 5 PC1s generated from AR1(.9) (left) and AR1 (.2) (right) red noise null proxies. 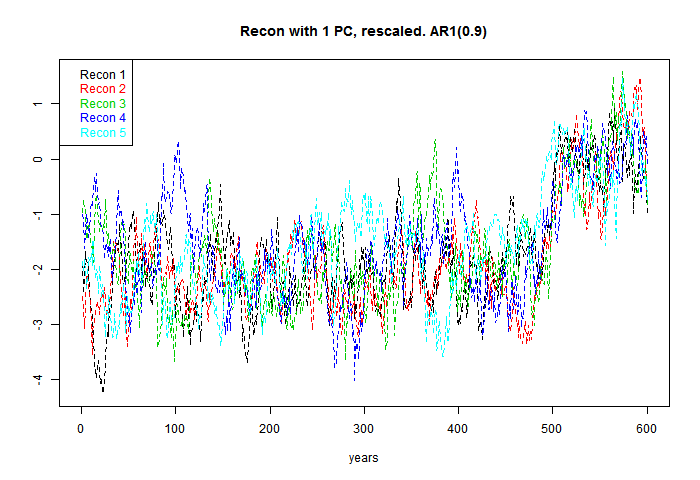 Each curve is the result of decentered PCA (last 100 years) on a set of 50 AR1(r) 'data'. Obviously, the r=0.2 version is much less HS-like, but still some. One of the elegant features of the NAS code is that they calculate the theoretical PC for the model, which is just the first eigenvalue of the autocorrelation matrix. I have some analytic theory here, for a coming post, but I'll just say for now that the HS-ness is about the same for low values of r; for 0.2 it is just beginning to increase. The NAS PC1 is in black. You can see how the other eigenvalues are picking up the variation in the HS shaft, and settling into a Sturm-Liouville pattern.. The decentering concentrated the blade variability in PC1. Update. This actually shows what decentering is doing. The S-L pattern with orthogonal polynomials, say, start with constant 1. So you would in PCA, if you didn't subtract the mean. It reflects the chief common pattern, which is offset from the mean. But that's not interesting, and subtracting the (centered) mean promotes the second eigenvector to leading. It makes no radical difference, but saves arithmetic. Decentered, that constant PC comes back, with a kink. Again, it makes little real difference. You may just have to use one extra PC in the recon. You can see why the sign of PCs doesn't matter. L is there twice. Then the recon is just the row mean of this matrix. So I'll calculate the 5 recons of another set of random data using just one PC. I've used the NAS HS index to orient, and scaled by standard deviation of the whole curve. I should say that this is not justified at all in general; while PC's are sign insensitive, recons certainly aren't. However, we're reconstructing essentially zero plus noise. I'll then show what it looks like without scaling. This reflects the fact that while the PC maximises the magnitude of the data in the new basis, the scalar product with another vector, which is the recon, can be of different size and sign. In this very simple analogue, we're reconstructing zero plus noise. Anything can happen. OK, now we try a recon with 2 PC's, rescaling again by HS index etc. Still the same data (for all recons, not re-randomised). All gone. And three PC's would be a small number of PCs to retain in a reconstruction. Remember, this was the extreme case of AR1(0.9), where the HS effect on PC1 was very large. But it was not creating HS effect from nowhere. It was just transferring it from other PCs to PC1. The code, adapted from the NAS code, is here. Top is their emulation of MBH, decentered. The bottom figure combines the effect of centering and removal of Gaspe cedars (which I think is unwarranted). It's a pity they didn't show just the effect of decentering, but even so, it isn't much. It shows that PC1 doesn't have much to do with the outcome. There's a post at Climate Audit on Kevin O'Neill's comments exposing aspects of the Wegman report. I would like to respond there, but am currently not able to. All my comments go to spam, and at CA, they don't re-emerge. I'll say a little about this situation. It affects my interaction with all Wordpress blogs. Last month I was temporarily banned at WUWT, in circumstances I describe here. The mechanism is that I was designated a spammer, and my comments went to spam. After a week or so, I tried commenting again, but same result. This apparently was picked up by Akismet, and my comments at CA started going into moderation, then into spam. Same at other Wordpress blogs. I can comment using my Twitter ID, but CA does not allow that. WUWT nominally does, but my comment was removed because Twitter substitutes my Twitter address for the email address. So I'm out there too. "One of the most compelling illustrations that McIntyre and McKitrick have produced is created by feeding red noise [AR(1) with parameter = 0.2] into the MBH algorithm. The AR(1) process is a stationary process meaning that it should not exhibit any long-term trend. 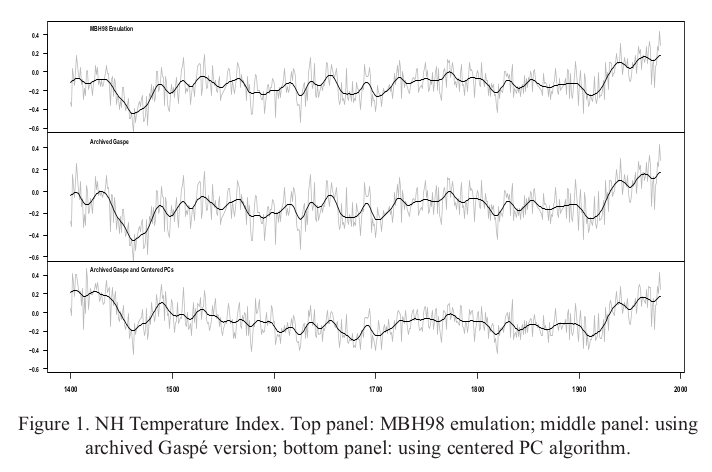 The MBH98 algorithm found ‘hockey stick’ trend in each of the independent replications." 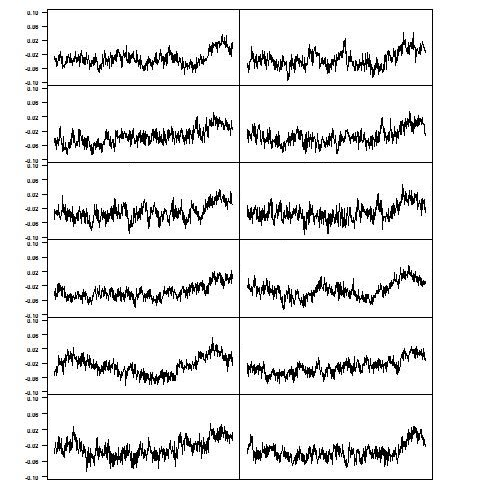 As DC found, what they had actually done, using M&M's code, was to do 10000 runs with red noise input, select the top 100 by hockey stick index, and then select randomly from that 100. I described the consequences of this here. I showed, inter alia, that selecting that way gave hockey sticks whether you used Mann's off-centre PCA or centered PCA. Brandon Shollenberger responded by trying to move the goalposts. 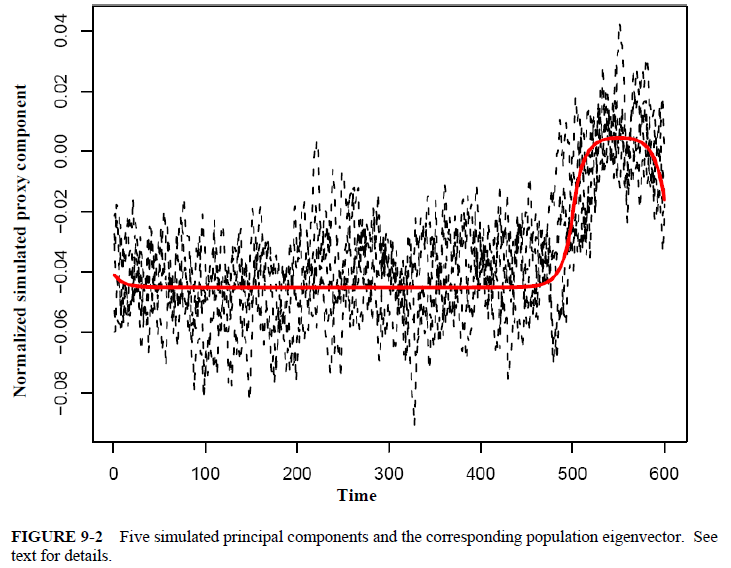 The selection by HS index used by Wegman had the incidental effect of orienting the profiles. That's how DC noticed it; the profiles, even if Mann's algorithm did what Wegman claimed, should have given up and down shapes. Brandon demanded that I should, having removed the artificial selection, somehow tamper with the results to regenerate the uniformity of sign, even though many had no HS shape to base such a reorientation on. And so we see a pea-moving; it's now supposed to be all about how Wegman shifted the signs. It isn't; its all about how HS's were artificially selected. More recent stuff here. So now Steve McIntyre at CA is taking the same line. Bloggers are complaining about sign selection: "While I’ve started with O’Neill’s allegation of deception and “real fraud” related to sign selection,...". No, sign selection is the telltale giveaway. The issue is hockey-stick selection. 100 out of 10000, by HS index. Update. It seems that if I disown my WP id, and change my name slightly, I advance at CA from the spam bin to the moderation queue (probably as a first time commenter). That can be a long wait too, but we'll see. Update. In comments, Rachel from "Engineering Happiness" made a helpful suggestion about contacting Akismet. I followed advice, and someone emailed me. Not solved yet, but we're working on it. Thanks, Rachel. I've long been interested in what can be done with irregular triangular meshes. And lately I've been using them a lot, in apps like this. 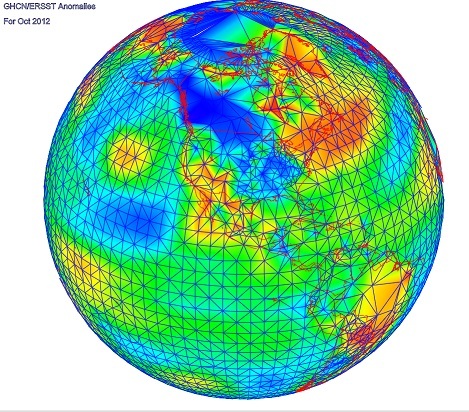 If you have a set of data on the Earth with no special pattern, like temp measurements, then the best way for both analysis and graphics is to create an irregular mesh of triangles joining the points. Here is an HTML 5 version which allows you to display the mesh. In earlier times in finite elements, problems on meshes were often solved with direct solvers, which greatly benefit from a banded matrix. This depends on node numbering. On a regular grid, you'd number by rows; in an irregular mesh something of that can be achieved by an advancing front, which passes through every node, and numbering is by order encountered. I have found two current requirements for a front. One is in a shorter way of defining the mesh, for web transmission. And the other is in WebGL. For the latter, I've developed a more easily visualized method, which, as you might guess, leads to pretty pictures. And yes, WebGL. It describes the mesh as a peel. The rind is one triangle thick - each triangle has two nodes on one side, and one on the other. Well, mostly. Details below. Update: I found that the original mesh had some incorrectly oriented triangles. 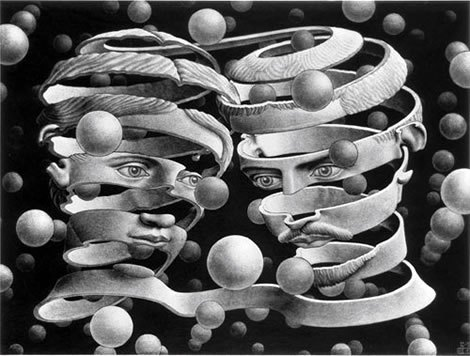 The method assumes consistent orientation, so it's rather surprising that the algorithm ran to completion. Anyway, it looks much more regular now. You can't avoid listing the lat/lon of the nodes. The simple and usual way of listing the connecting lines is by listing each triangle. But there are typically about twice as many triangles as nodes, so each node gets mentioned six times in total, on average. If you can reproduce the motion of a moving front, you only specify each node once, when it is encountered. Since the front passes through each triangle, about half the triangles are created without listing a new node (infilling), although a few bits of info are needed to indicate the kind of infill. This is what I currently do, and it is a big plus for the apps mentioned above. But the front does not advance in an easily visualized way, and so for WebGL I need something else. I've described the use of WebGL elsewhere, for example here. Because it's highly parallel, it tends to be very verbose, since it sends copies of everything rather than use pointers. So every time you mention a node, it is by coords and color - 7 floats. And as above, the default spec by triangles mentions each node about six times. WebGL mitigates this with two structures - TRIANGLE_FAN and TRIANGLE_STRIP. The first is just a ring of triangles around a node. The second is a strip of rectangles with diagonals (all the same way). The saving is that in each, nodes are mentioned once, in each strip, say. That's twice in total, instead of six. The strip sounds a bit limiting, but there are various ways you can stop and start. You can add degenerate triangles. So my ambition here is to develop a front that works like peeling an orange with one continuous rind. I don't have the strip in WebGL working yet. But I do have pictures. It works by in effect rolling a triangle from start to finish. Not the same triangle, but moving from one to another in a series of fans. I rotate anticlockwise. There is always a front dividing "old" and "new", and when the fan reaches "old", it switches pivots, and starts another fan. The picture below shows this with shading. The "old" side of the peel is blue, the new is red. There is a blue line joining the centroids of the triangle in number order. Sometimes the rolling gets stuck; it tries a new pivot, but can't move. You'll see those as solid blue triangles in the pic. It escapes by backtracking to the nearest pivot that can move. It's also possible that the front can form a pocket, leaving behind a set of triangles. There's provision for it to check and go back and fill in those areas. There will be a cost in describing that, but it doesn't happen often. 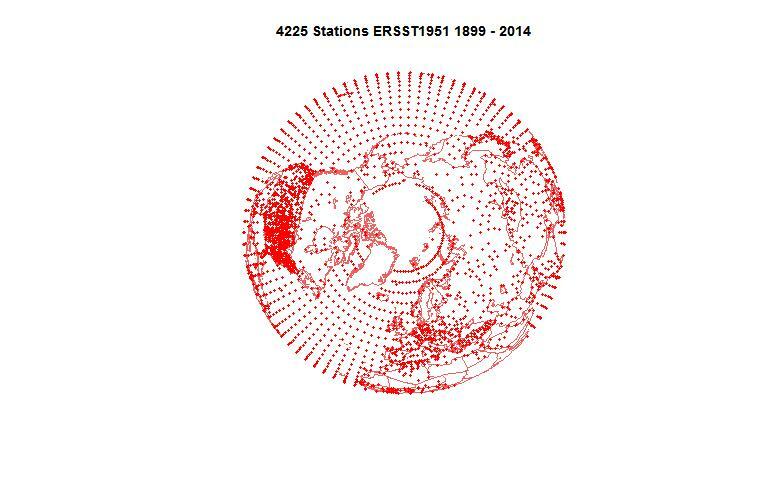 So here is a picture of about 4000 stations (GHCN/ERSST) that reported in some recent month (I've lost track of which). The mesh comes from R's convhull(). There is a red triangle in the Mediterranean where it starts, and end in a white triangle in the W Pacific. I think it is quite interesting how it adapts to very different density in, say, US vs Africa or Antarctic. It's like a big spiral, and as mentioned above, the "old", or inside edge is blue, outer red. The usual WebGL facilities - Earth is a trackball - right button drag up or down to zoom. GISS has posted its August estimate for global temperature anomaly. It rose from 0.52°C in July to 0.7°C in August. TempLS rose by 0.1°C, which I commented was in line with the rise in SST. GISS once again is jumpier, and like TempLS is back to the high levels of April/May. The comparison maps are below the jump. Trend Map to show why Cowtan&Way is needed. Nearly a year ago, Cowtan and Way published an important paper on modifying HADCRUT 4. HADCRUT is a global index put out by the UK Met Office and UEA. It uses gridding, and has many grid cells which have no data. These are just not included in the average. The arithmetic effect of this is that the empty cells are given the value of the remaining cells in the average, which for HADCRUT is the hemisphere average. Normally this might not matter much, because the missing areas are on average, average. But recently the Arctic, with much missing area, has been warming rapidly, and HADCRUT has been missing that. One C&W remedy was to use kriging interpolation. Another was to make a hybrid with UAH satellite tropospheric measures, which covers lot of the missing region. Importantly, they got similar results, with a trend that seemed to allow properly for the Arctic warming. I wrote follow-up posts on C&W here, here and here. One observation was that latitude averaging would be better than hemispheric, since infilling with the latitude average was likely to be closer. And that gave results somewhat similar to C&W. I'm going to develop this. But meanwhile, I want to show visually just what C&W does. 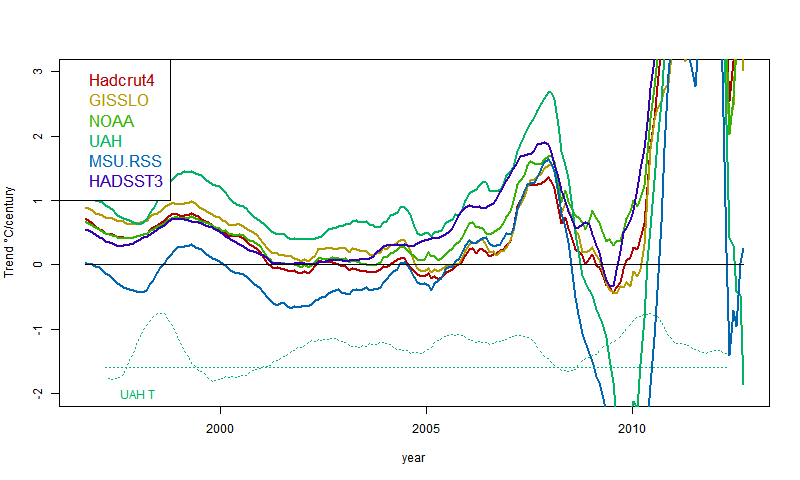 I have made a WebGL active plot, which shows with shading the trends over various user-chosen time intervals. For HADCRUT, I explicitly infilled cells with the Hemisphere average. I show C&W with kriging - no infill is needed. So for HADCRUT areas with little data will show with the hemisphere average trend. 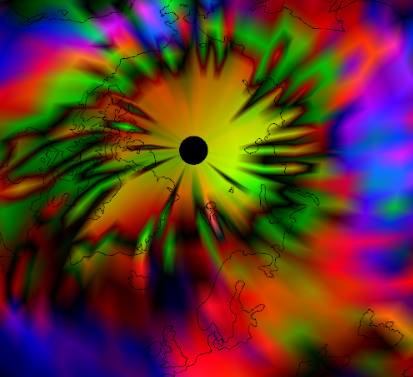 With WebGL it is inonvenient to color cells as rectangles, so I have used shading. The plot and discussion are below. You can select a dataset (currently HADCRUT 4 or C&W kriging), a start year and and end year. We're limited in years by the C&W data. Click "Plot New" when you have made a selection. As usual, the earth is a trackball which you can drag; the orient button will set it to map orientation, keeping your current center in place. You can right click and drag up/down to zoom. You can see in the HADCRUT plot a set of reddish strips. Those are cells with data. The remaining greenish area consists of cells that have been assigned the hemisphere average, and so reflect that lower trend. That is arbitrary, and you can see the contrast. 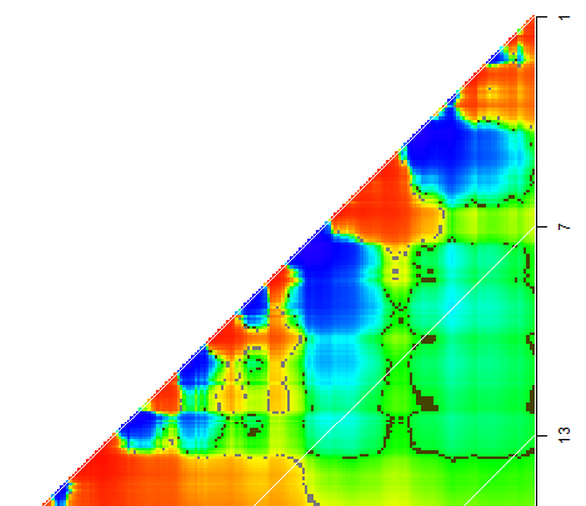 The Cowtan and Way plot on the right has infilled with Kriging interpolation. 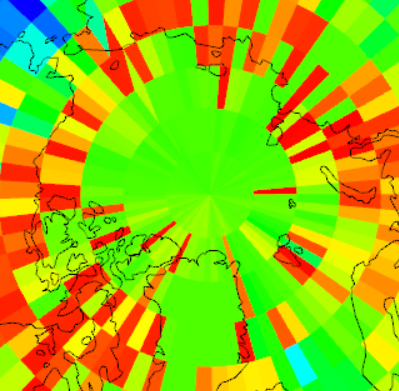 The colors don't quite correspond, but you can see how the hemisphere infill is replaced by local values. Update. I should add a caution here. With HADCRUT, I infilled empty cells with hemisphere averages for each month. Where there is no data over the period, you see the color of the hemisphere average. Where there is, you see the correct trend. But where there is a mix of infill and data over the period, you see a mixed trend. I think some of the yellow strips around the Pole reflect that. If you want to compare, I suggest running two browsers side by side. Use Ctrl- to shrink to fit two on the screen. I'll post soon on other ways of interpolating; Kriging is fine, but I think any reasonable scheme will do. TempLS can do it with linear interpolation on a regular triangular mesh. The triangle shows with color shading the trend from any starting year to end year, in a range that you can choose (from 1999, 1989, 1960 or 1900 to now). There are settings that show just trend, trend with significance masked, or CI's (upper or lower) or t-values. And there are now 15 datasets - monthly temperature series. Each triangle has an accompanying plot of the time series. The active aspect is that you can choose a time range, and numerical information about the trend will be shown, and colored markers will show the trend line on the graph. You can choose either by clicking in the triangle, or using controls in the graph. I have now added four new data sets. They are from Cowtan and Way, BEST Land/Ocean, NOAA SST, and a new TempLS set. I'll describe each in detail, and give links to the sources. Kevin Cowtan's home page is here. They took HADCRUT 4, which uses a grid but omits cells that have no data, and used different schemes for estimating the empty regions. The motivation is that recently there has been warming in the Arctic which HADCRUT was not detecting properly. 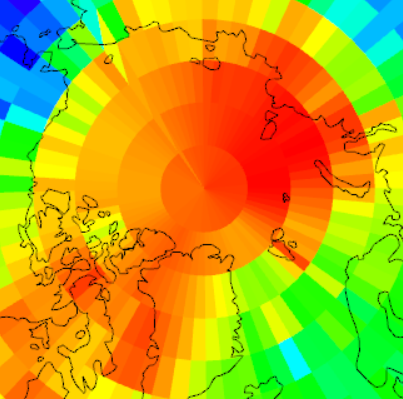 They used kriging interpolation, and hybrid schemes making use of satellite data. I'm showing the kriging results here. Berkeley Earth started with land only, and that remains their prime product. They only update their land/ocean data annually. They use HADSST3 for ocean, and as with all land/ocean indices, this has a dominant effect. I'd really like to be able to show the OI V2 SST, which is kept very current. But although it's easy to download spatial data, for some reason the global index can only be got interactively. So I'm showing the regular product which comes out late in the month. 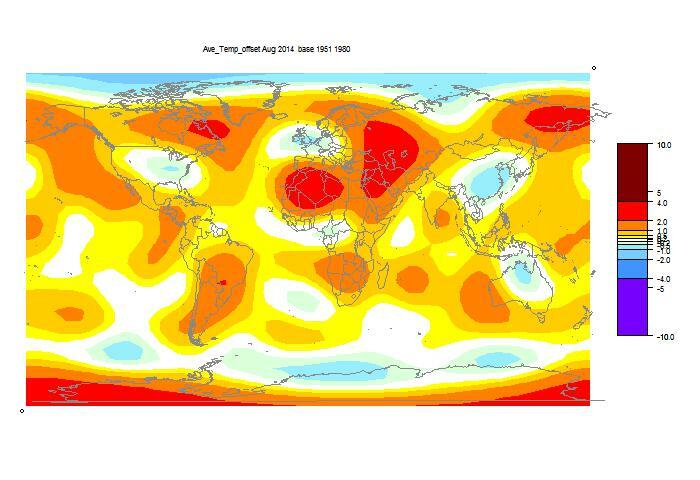 TempLS is my least squares global temperature index program. My recent post gives some background, and a comparison. It is basically an area weighted regression, and I have been using a traditional scheme whereby the weight is assigned according to each stations share of its gridcell area. This gives similar performance to actual gridded schemes, and that recent post was to show how well it follows NOAA. But this has the same faults that Cowtan and Way were trying to fix. No weight is assigned to allow for empty cell area, of which there is much in the Arctic. TempLS offers various weighting scheme, one of which is essentially finite element integration on an irregular triangular mesh. This has no problems with empty cells, and no problem with cells getting small at the poles. I have felt that Cowtan and Way's kriging was overkill, and that any interpolation (here linear) would do much the same. This is an opportunity to test. I'll write more on this soon. Here is a table of links to the data files. TempLS rose in August; from 0.515°C (July) to 0.613°C. This largely reflects the strong rise in SST. It's often forgotten that a land/ocean index is mostly SST. Anyway, TempLS is back up to about where it was in May. The tropospheric indices went down by a little over 0.1°C. This post relates to a technical meaning of the pause, often dwelt on on skeptic sites. Some number of years for which the global temperature trend to present has been negative or zero. Of course the pause itself should be more broadly defined as a period where the trend is substantially less than some expected value. But the zero trend seems to attract people, so I thought some prognosis of it might be interesting. Actual zero trend tends to get mixed up with trend not significantly different from zero. I'll stay away from the latter as I think it is a misuse of statistical significance (SS). If you have SS, you can infer something. If you don't, you can only infer that a test has failed. Maybe too much noise; maybe an inadequate test. Werner Brozek runs monthly articles at WUWT. He looks at a variety of indices, and notes the number of years of zero trend. He also looks at SS tests, which I think are misplaced. Anyway, something is happening there. The pause given by most indicators is shrinking. "But, until the discrepancy is resolved to everyone’s satisfaction, those of you who REALLY REALLY need the global temperature record to show as little warming as possible might want to consider jumping ship, and switch from the UAH to RSS dataset." Lord M is following that advice, as we shall see. Indeed, from 18 years ago to present, RSS has zero trends. 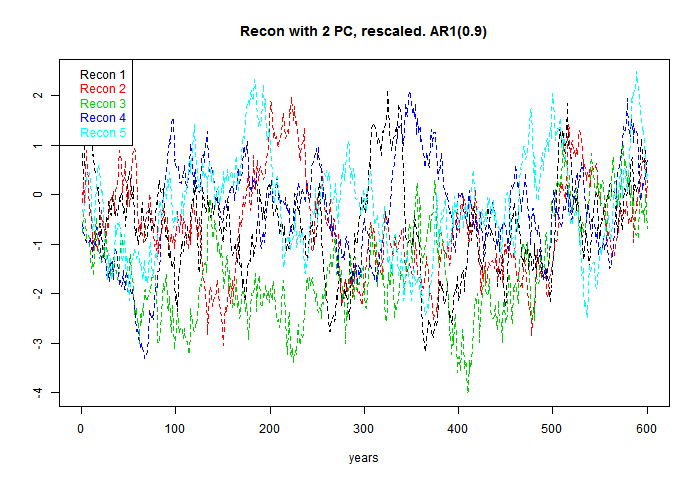 But as you'll see below, all other indices have trends from 0.5°/Century to 1°/Century. No 18 year pause there. The skeptic convention is that the pause goes back to the earliest crossing of the x axis. So for example HADCRUT 4 would be "paused" since about 2001, and you can see Lord M's 18 years for RSS. You can also see why he likes RSS. It really is an outlier. Interestingly, UAH is almost an outlier in the other direction, with a pause of about six years. The surface measures are fairly consistent. The right end is where trends ending at present are found, and as you go down, the starting point gets earlier (difference in years shown on axis). As you go left, the end point gets earlier. The diagonal shows trends of 1 year duration. So the plot above represents colors along the right edge. Brown represents zero trend, and you can see a bluish (negative) area bottom right, where the brown boundary tangles with the edge. The brown points on the edge correspond to the crossing points (red HAD4 crossing the x xis) in the graph. You'll see something similar in other plots that you can get by pressing buttons. The key thing is that we are reaching the edge of that region. It will soon be left behind, and won't leave any brown on the axis. The pause will contract dramatically. Here is a movie plot that shows that. I have plotted how the trend plot would look if you started in March 2014, April etc. And I have padded the future with reflected temperatures - August supposed to be the same as July, September =June etc. This enables us to see how the arithmetic pans out if the present warmth continues. There are in fact data for UAH and MSU-RSS for August, which I have used (both went down). Click the buttons at the top to flick through. You'll see from March onward, all the plots are moving up, so the pause has tended to shorten. Not so much for RSS, though, as Lord M has been repetitively noting. Now the interesting thing is that projecting through to November, all the indices except RSS have cleared the axis, and UAH still has the 2010 dip. Even HADCRUT clears, though only just. No more pause at all for surface indices! I was reading Bob Tisdale at WUWT, an article titled: "Alarmism Warning – Preliminary Monthly Global Sea Surface Temperatures at Record High Levels". With explanation: "An “alarmism warning” indicates alarmism is imminent." "We’re not just talking a record high for the month of August…we’re talking a record high for any month during the satellite era." Now I'm always anxious to alert readers to imminent alarmism, so I advise reading Bob warily. But I thought I should find out more, and as usual, Bob has an impressive pile of graphs. Here's my take. Bob breaks it down into regions, emphasising the North Pacific as the standout for warmth, with North Atlantic second. For good detail on that, Moyhu has a WebGL plot (choose your day), and for the N Pacific (and elsewhere), current movies. But I'm more interested in the global SST. Actually, Bob's plots there are comprehensive. 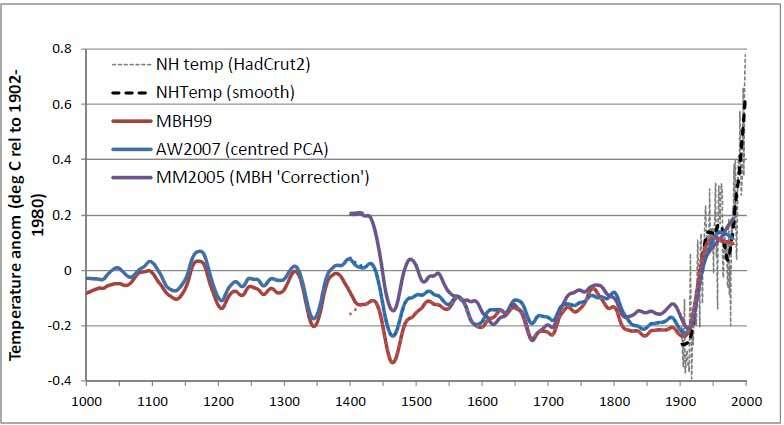 But I'd like to show longer and shorter scales, and a comparison with Hadcrut 4 surface temp and UAH lower troposphere. So here is a composite plot. 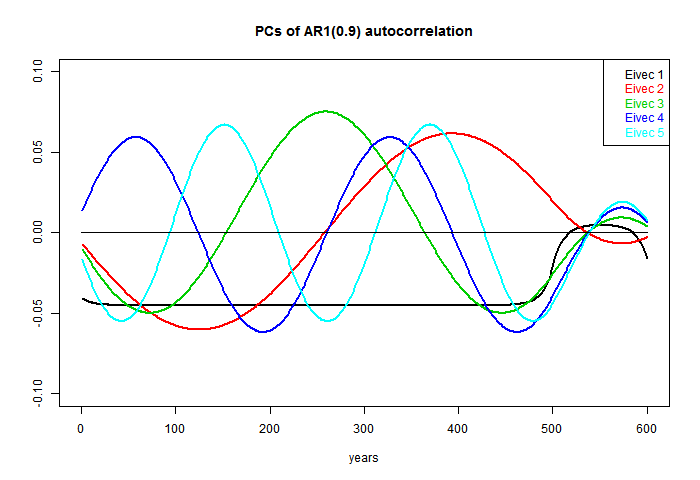 You can switch between year ranges (1850-now, 1980-now, and 2005-now) and smoothing (none, running annual mean). For all but the longest range, NOAA SST means OI SST, anomaly relative to 1971-2000, and includes August 2014. For the long range, it is this file. I have arbitrarily subtracted 0.2°C from the Hadcrut 4 anomalies, for better plot match. The idea is to show that SST is usually the leading indicator of a change, with GMST lagging, and TLT often the last. In fact, GMST has been quite high (records in May and June) but drifting down lately; TLT (UAH and RSS) has not been very high, and also little recent rising tendency (UAH went down in August). Details here.